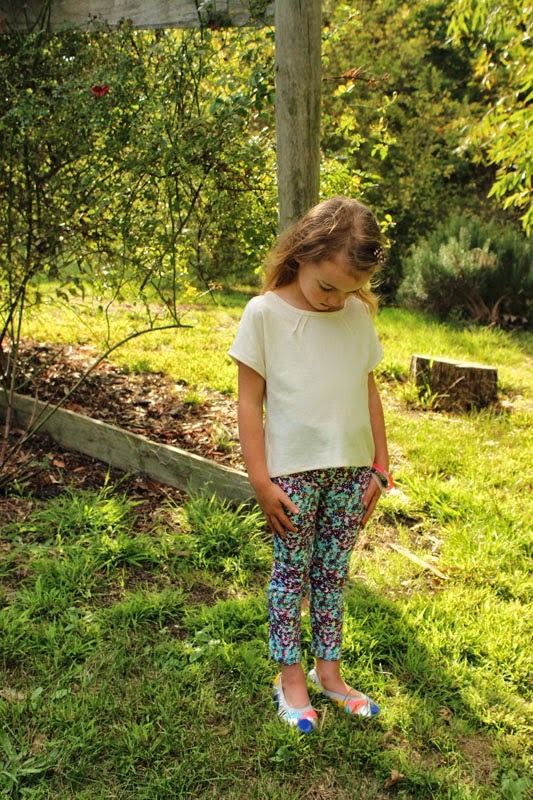 Hi there:) Today I am sharing a little outfit I made Isabella with two great patterns - The Celestial tee by Figgy's and Hosh pants by LouBeeClothing. 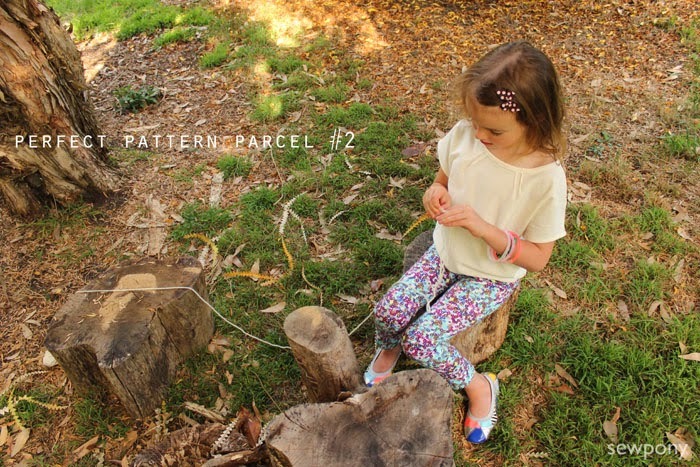 These patterns are two of the five that are bundled by Perfect Pattern Parcel. PPP is a new company that allows the buyer to select what they wish to pay for the bundled five patterns. A percentage of the sales goes to the designers of the patterns and the rest goes to charity. If you pay more than $24 you will 'unlock' the bonus pattern - the Prefontaine shorts by That Moxie Girl. I used a cream jersey I had in my stash for the tee. I changed the neckline a little - made four exposed pin pleats instead of the three inverted ones. The pants are made from a funky printed stretch cotton drill. I found it at Lincraft. It reminds me of little sequins. As you can see from the photo above, it is autumn here in Australia! Our property is looking beautiful with green grass, falling leaves, ripening pomogranates and birds galore! Both patterns are great, quick and easy. The hosh pants have no side seams which is cool. I love the general shape and how smart they look. The tee is feminine and I like the uneven hem...it reminds me of a ballerina t-shirt - one to be worn over a leotard by elegant dancers! Isabella was happy for me to photograph her on this particular afternoon as long as I capture her and her new talent - finger knitting! What a lovely outfit! I really like the cream top, and those pants are fabulous. You got the fit spot on. I just bought the parcel yesterday, and I'm trying to decide which one to start with :) Congratulations to Isabella on her new skill! She'll be creating alongside you before you know it! Thank you Fiona for your lovely comment! what a beautiful outfit! I love the fabric you used for those Hosh Pants! What a great outfit, Suz! I love it! When the weather cools off around here (in about, oh, 6 months!) :) I will definitely put this one on my to-make list. 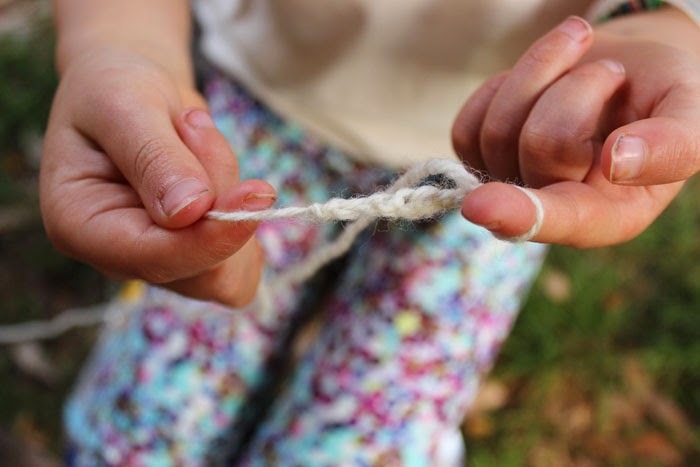 Also I love the photos of her finger knitting. Love. We are supposed to incorporate knitting into our homeschool - according to our curriculum - but didn't spent too much time on it this year. 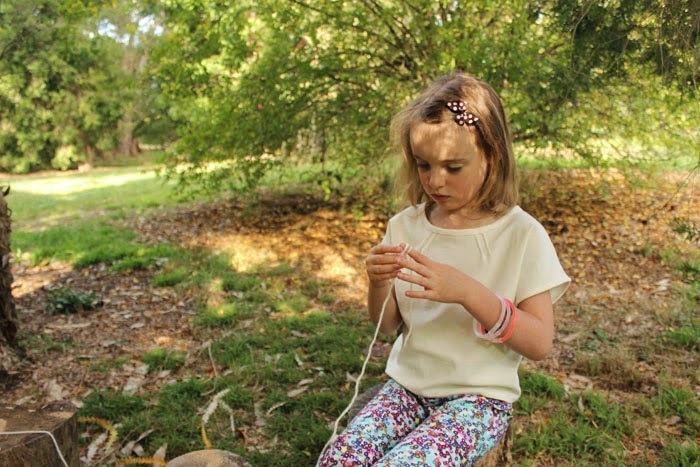 This summer, Indigo and I have plans to take a knitting class together. What a lovely outfit! It looks so feminine and comfortable. She does looks a little dancer in it. Looks great. I love the combination together, such a cool comfy weekend outfit. Suz, this outfit is so darling! It is super feminine. Just lovely! customary dull articles or bloɡ postѕ which are a waste of time. ߋf advice I had been searching foг, I'll be popping baсk the near future to hear what you've got to say.